Revolutionize the viewing experience with the 2-inch cube. Project 240-inch HD projection from a 2-inch cube. Sounds astounding! But its true with PIQO. The bunch of people had been in the entertainment technology space for years and have extensive experience working with commercial grade projectors in different corners of the world has developed ‘PIQO’. It is actually unique and with exceptional features. 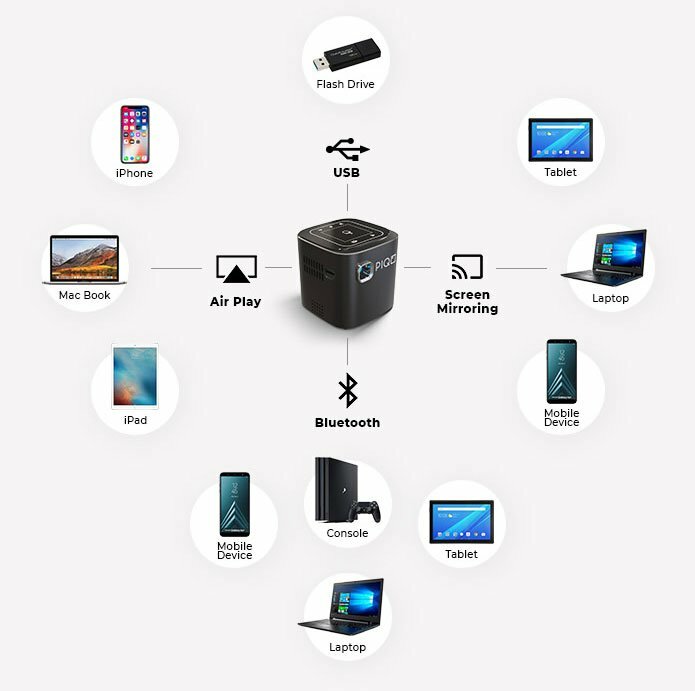 It connects wirelessly to any device you possess or directly via HDMI or USB. It has built-in WiFi, Bluetooth, Hi-Fi speakers, screen mirroring, offline storage, and a battery having 50 hours of life. With PIQO you are empowered to experience HD cinema from anywhere with seamless touch-control. Besides, this full of features 2-inch box can fit inside your pocket, small handbag or briefcase. PIQO is compact, durable and easy to use anywhere, anytime. Other projectors of this class are bulky and tangled in cables and adapters. 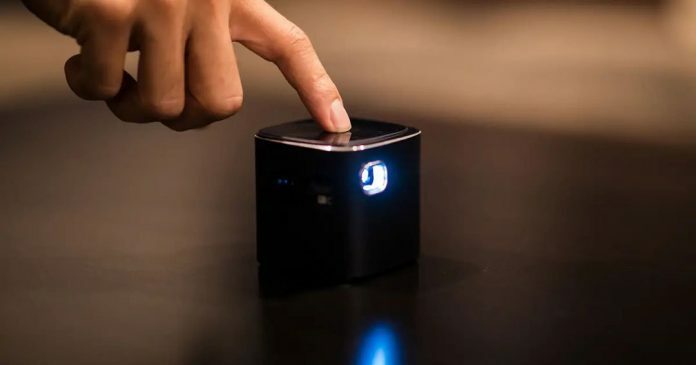 However, this tiny projector will offer you cinematic power and Hi-Fi speakers on the move. The most essential features you would be eager to know is cinema-quality. Relax, PIQO is just small in size but huge with quality and other features. It surpasses all other mini-projectors on the market. It provides incredible cinema quality colors and powered by industry-leading Texas Instruments DLP technology. Its 200 lumens of projection power enables strong contrasts while staying sharp at up to 240 inches. Regardless of the day or night, you will now enjoy HD viewing experience in astonishing clarity. It supports video formats up to 1080p HD for the sharpest picture. Its intuitive touch screen provides easy controls of your projector. The touchscreen on top of the PIQO allows you to select media, apps and more with drag-and-click at ease. It has five more touch icons to control volume, screen dimension, and navigation. What can you access using PIQO? Anything. PIQO can actually cast anything using Wi-Fi or Bluetooth 5.0 from any of your device. It is equipped with state-of-the-art gravity sensors that allow automatic angle adjustments. So that you can enjoy the same quality of projection onto any type of surface. Whether photos, videos or work presentation from your phone or iPad, you are ready to cast them anytime. This compact box merely not provide amazing projection from any seat of your home but Hi-Fi sound like in the theater. Its built-in Hi-Fi speakers let you enjoy crisp audio with nuanced mid-range tones and deep bass. So, with PIQO just forget about the bulky speakers and get engrossed in the theater like experience. PIQO projects at up to 240-inches clear and sharper image. 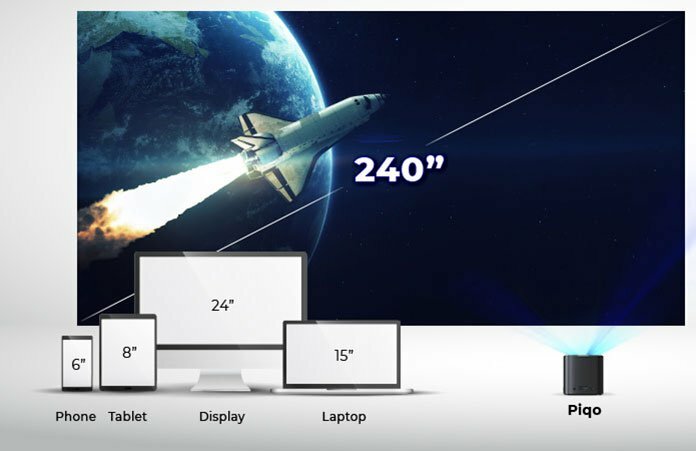 This quality is over twice the size found in the biggest commercially-available TVs and 10x the size of HD monitors. 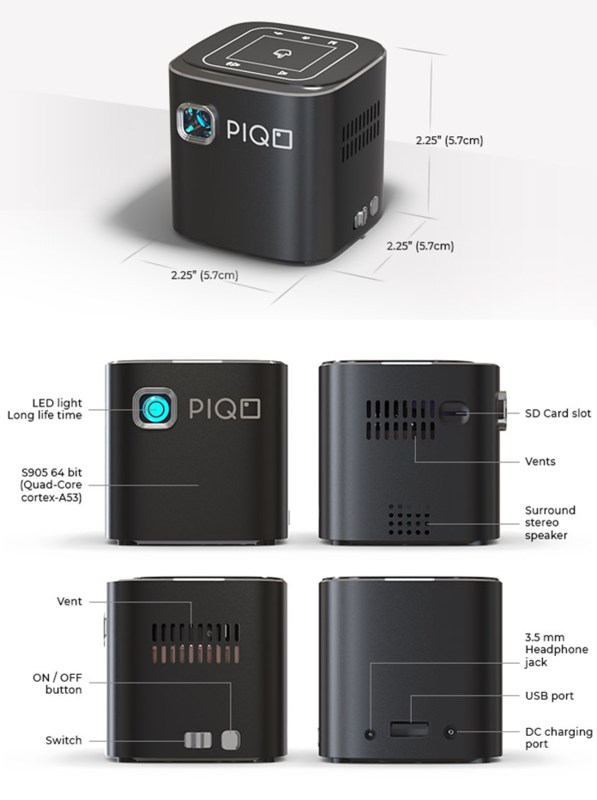 Unlike other mini-projectors on the market, PIQO provides 1 hour of video play time on 15 min of fast charging. It surpasses all other mini-projectors on the market in terms of battery life. It gives 50 hours of music playback and 5 hours of video playtime. It gives you universal compatibility by supporting Windows, Android, and iOS. This 2-inch projection box is compatible with 3 million applications and counting on the Google Play Store. You can enjoy almost all types of entertainment you found on your digital devices. Such as stream or download your favorite shows from Netflix or YouTube, play Candy Crush, manage your calendar and many more. Besides these all amazing features, PIQO houses offline storage to let you download directly to PIQO and watch it anywhere. Also, you can access your data without an internet connection. No matter what method of memory you use just plug and play. PIQO has ports to connect SD cards and USB drives. It is the smallest in size of 2.25″x2.25″x 2.25″. PIQO is ready to be your companion in every corner of your home and at the office. Such as getting the best possible view of your recipes or enjoy some entertainment in the kitchen, project on the ceiling of your bedroom to watch without straining your neck, etc.